One of life’s pleasures is looking at Ryanair’s destination map and allowing the syllables of lesser-known places to roll off my tongue. For years, the sound of Zadar captured my attention so when I eventually Google-imaged the city I was immediately transfixed and envisaged a visit. That happened when Ryanair reinstated the route from Dublin in 2013. As beautiful as Zadar city is, the descent along the mid-Croatian coast into its airport is one of the most scenic in Europe. Sit in seats A-C and get a view of Pag Island and the mainland. Sit in seats D-F and view the Kornati National Park archipelago. 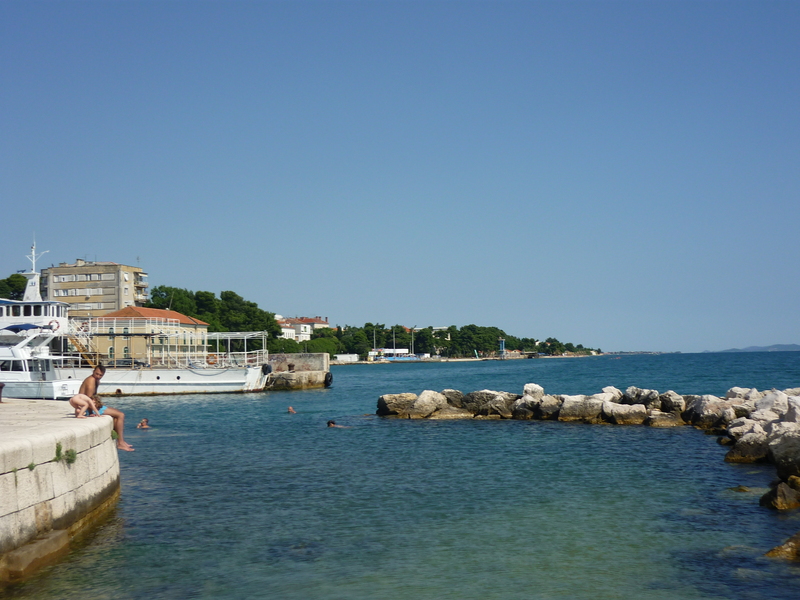 Zadar is located approximately half way on the lengthy Croatian coast across the Adriatic from Italy’s Ancona. The new city contains the main bus and railway stations and both are roughly a 30 minute walk from the historic Old Town. Ferries from Ancona in Italy and elsewhere in Croatia dock in the Old Town as do tours to the Kornati National Park. If it’s trendy boutiques, artisan crafts, carefree cafes and grand architecture from by-gone eras which grab your attention then a visit to Zadar’s Old Town is imperative. Located on a rectangular-shaped peninsula the Old Town is flanked on three sides by the harbour. There’s an Italian aura about Zadar so it’s no surprise that it was once part of the Roman and Venetian Empires, and the Forum and City Walls reflect these eras respectively. When the Austrians arrived in the late 18th Century they left the Italians in charge and the Old Town’s stylish architecture echoes this influence. Even the marble pavements look elegant if a bit slippery. Zadar’s Italian past permeates its cuisine with the almost generic use of olive oil, lemon and herbs yielding succulent results. Pasta and pizza are widely eaten but seafood, albeit delicious, is bizarrely an astronomical price. I can highly recommend Canzona Trattoria on Stomorica where I dined well amongst its multinational customers served by courteous and efficient multilingual waiters. The courtesy was genuine here and elsewhere. Throughout my travels in Croatia, men have been respectful and friendly to me regardless of situation. Meandering the Old Town stopping for coffee, pastries and ice-cream is an absolute pleasure but for the perfect passeggiata or even post-dinner stroll the recently renovated southern quayside between the university and the harbour is the Adriatic’s version of Nice’s renowned Promenade des Anglais. Known as Obala Kralja Petra Kresimira IV on maps this quayside contains the world’s only Sea Organ, a feature where the lapping harbour water enters a series of perforations in the stepped concrete quayside yielding meditative horn sounds. It’s worth waiting for the large Jadrolinija car ferries to enter and exit the harbour as the choppier the water the louder and more melodic the sounds. A couple of metres away from the Sea Organ is another unique attraction, that of the Greeting to the Sun or Sun Salutation. Solar-powered photovoltaic cells built into the pavement under glass panels emit their energy at night producing a disco-like collage of colours to match the stunning sunset. I couldn’t help but notice how clear the water around the quayside was. As I strolled towards the university I saw numerous people swimming in it with hoards sunbathing on the adjacent pavement proving that Zadar can double as an urban beach holiday as well as a city break. Zadar Old Town has numerous churches with St. Donatus’ Church the best known. Immediately beside it is St. Anastasia’s Cathedral, St. Mary’s Church and the remains of the Roman Forum. West of this complex is St. Elia’s Church and beside this a column known as the Pillar of Shame. I sincerely hope that Zadar doesn’t turn into a stag party destination as this monument could very well become an unfortunate focal point. Along with the off-shore Kornati Islands National Park, Zadar is within driving distance of four mainland National Parks: Velebit, Paklenica, Krka Waterfalls and the UNESCO-listed Plitvice Lakes. Zadar is an excellent base for travelling to the numerous neighbouring islands and the website of Jadrolinija, the efficient state-run ferry company, will prove useful when planning island daytrips. Sparse tourist information on Zadar was available prior to my visit so I discovered it on my own with a little help from two amiable Northern Irish students, Jane and Michaela. Let’s hope the library of information available on the city grows and that more people will experience the Croatian treasure that is Zadar. Interested in learning more about Croatia? Then check out my Croatia travel guide post. Great Report, and glad you enjoyed Zadar, been living here 8 months and just love the place. better than anywhere I have ever had a holiday. I also would recommend it to all ages, young and old. Most local speak really good English, no problems with language barriers. If you need any help just ask anybody they will go out of their way to assist you. Great Place ! !